Echoes of Hall Place is an art project that brings together Fine Art Photography with a Public Art installation and community interaction. I was commissioned to develop the work by Centrepieces, an arts and wellbeing charity and the London Borough of Bexley Council. The commissioning agents have been wonderfully supportive giving a wide range of artistic freedom. The work has been installed over January and February 2018 for viewing by the general public at Hall Place, a historic house in the South East of Greater London, UK. 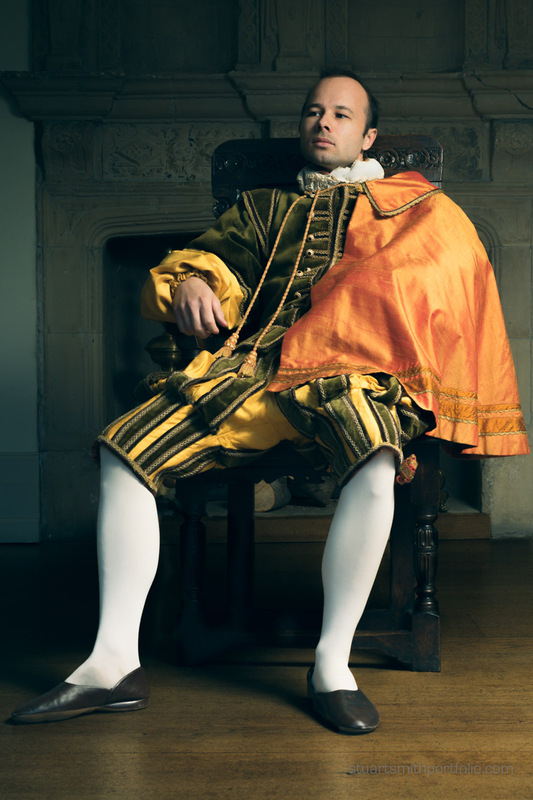 Hall Place has a wonderful history stretching back to Tudor times. Echoes of Hall Place is a fine art photography installation celebrating the history of the estate and connecting it with the present and looking to the future. The completed collection is displayed outside of the mansion’s visitor centre and comprises of 6 portraits. 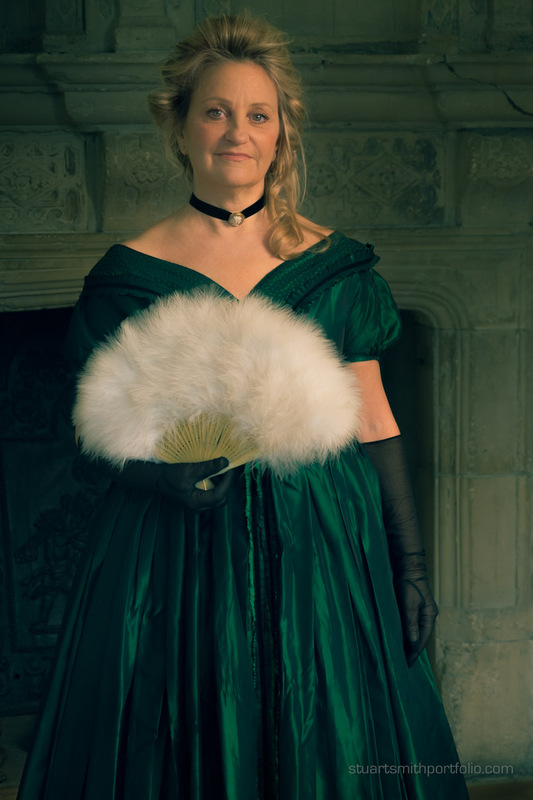 These are of contemporary subjects wearing period clothing. The portraits echo the type of visitor Hall Place may have seen over the years. Inside the visitor’s centre is a large mirror decorated with Tudor roses reflecting the history of the house and of course visitors who choose to look into it! 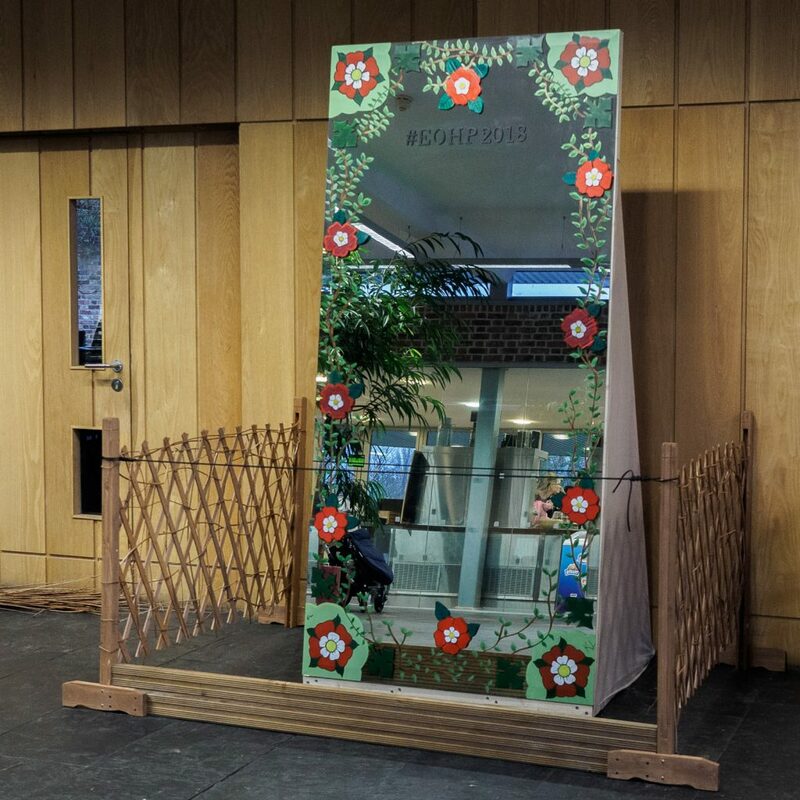 Those choosing to use the mirror are invited to take a ‘selfie’ and share it through Social Media using #eohp2018. In developing the visual concept I have been influenced by the technique Chiaroscuro. The past quickly becomes a shadowy place and chiaroscuro is used to represent that in the portraits. Artists such as Caravaggio, Rembrandt and Holbein used chiaroscuro. In the era of cinematography, Gordon Willis has used the technique in notable works such as Francis Ford Coppola’s The Godfather. 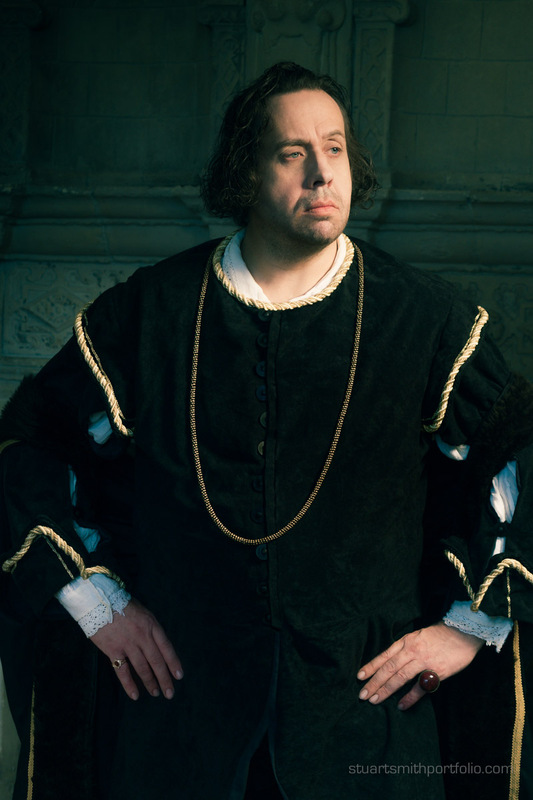 I decided not to directly represent any real historical characters in this project. 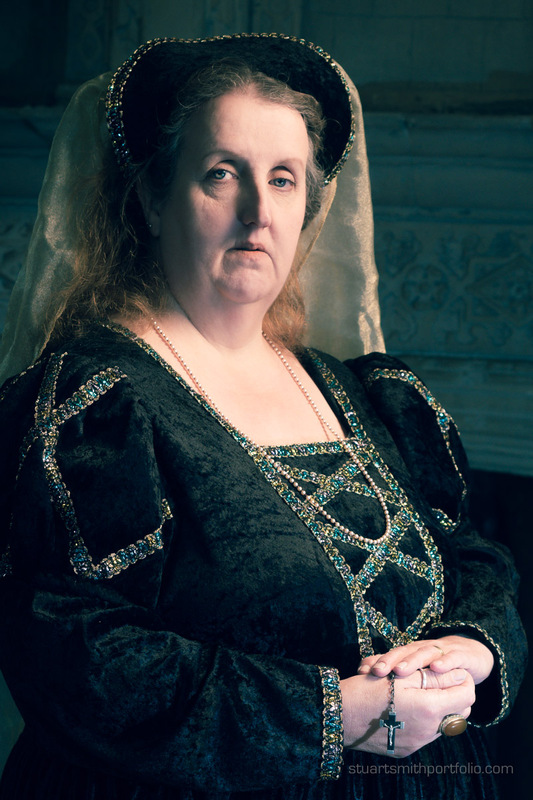 Hall Place does have links with the Black Prince and Francis Dashwood (of Hellfire club notoriety) but I wanted my portrait subjects to be open to a looser interpretation by viewers than representations of ‘real’ characters would allow. The subjects in the photographic portraits were all volunteers who either had a direct link with the vicinity of Hall Place or were supportive of the aims of Centrepieces. Whilst I didn’t avoid using models (some of the subjects did have modeling experience) it was the link to the aims of the charity or local geography that was most important. I wanted to bring forth the past and link it to the present ongoing story of Hall Place. 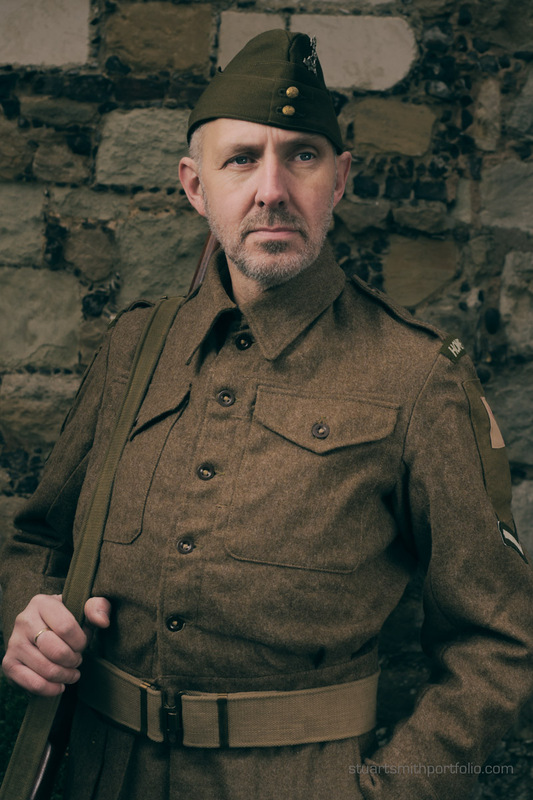 The resulting fine art photographs are 6 portraits that take the viewer from the Tudor origins of Hall Place through to the Victorian era, then on to the Roaring Twenties and finally World War 2. I chose to stop at WW2 because that seemed to be the place in the history of Hall Place when it really begins to head towards its current municipal role. Today Hall Place is somewhere the public come to enjoy the grounds, the Tudor mansion and various exhibitions and events. I needed some way of demonstrating that Hall Place, whilst steeped in history, is still very much alive and has a continuing story. Also, I wanted to reflect on how portraiture has expanded from the relatively isolated experience of the painting of nobles and the landed gentry into increasing democratization through the current ‘selfie’ via smartphone phenomenon. To this end, I developed the concept further to incorporate a large mirror, decorated with Tudor emblems. Centrepieces’ artists, through workshop sessions I ran, created Tudor Roses to decorate the mirror. The mirror invites the public to reflect on their own role in the ongoing history of Hall Place and contribute by creating their own selfies. The Tudor inspired decorations on the mirror remind us of the long history of the estate which will continue to echo into the future through the sharing of the selfies on Social Media. Echoes of Hall Place is a temporary installation. The portraits that adorn the walls will soon be removed and the mirror is taken away. However, the digital era means that echoes of it will continue to reverberate through the selfies and other shared assets. The past echoing into the present and looking to the future. I am available to work on further commissions both in the public arts and privately please do contact me to talk about it further. It was wonderful to be involved in your project, Stuart. You are of such a generous nature, patient and empathic with us ‘models’ and with the members of centrepieces. Your enthusiasm knows no bounds and you give so much of yourself modestly, for others enjoy to your results enormously. You are very special and it is a real privilege to know you. Thank you Fiona, that is so lovely of you to write that It means a lot! Centrepieces is very special and I am very glad that this project has given me the chance to create art and get to know better wonderful people, like you.